Hello friends. I have been absent for a while but I have been following a lot of your blogs. There is a lot going on in my life right now. All good things but a few minor adjustments. I have taken on more tasks and as a result my blogging has taken a back seat. I have so much to share with you. So stay posted as I have lots of good things to show you. Priyasha will be three years old or as she used to say " I am two going on twenty " Now she has changed that to " I am three going on twenty three " OH so cute. I am planning her party and it is going to be a blast. I cannot wait to show you all she and I have been working on. For now I uploaded loads of pics and wanted to share these that go back to Pravan's fame. That day it aired on TV I had several unexpected guests but it was a pleasant surprise. 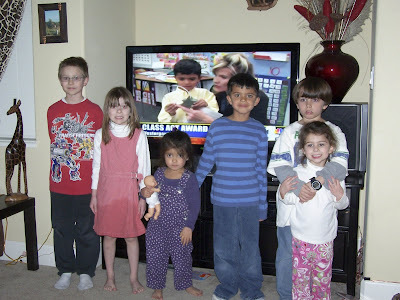 A few of Pravan's friends showed up and were able to watch him on TV. Here are some pictures for you to enjoy. Thanks for stopping by and as always I appreciate your thoughts and comments. When Pravan saw himself on TV he was so embarrassed and shy. He is in blue, can you tell ? We had his friend Dylan and his sister Raya who is Priyasha's BFF. They are holding each other. 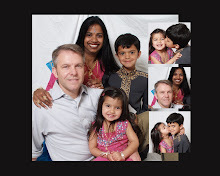 They we have Joshua and Bethany who are siblings and both are Pravan and Priyasha's friends. When his friends left he wanted to watch it again and since I had it recorded Pravan and his sister watched it one more time. 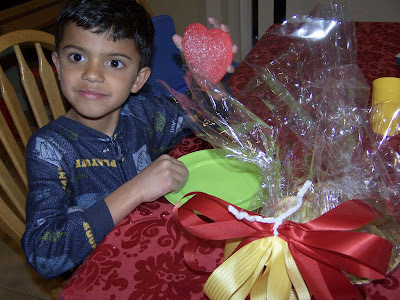 After dinner Pravan got to dig into his cookie basket and gobble up cookies.These cookies were from a gourmet cookie shop and were presented to him with the award.They were yummy !!!!! 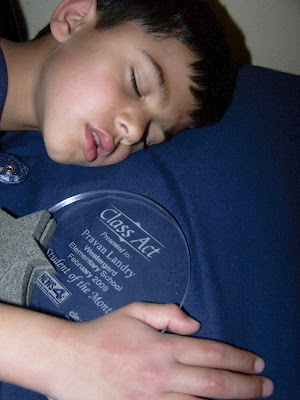 Pravan is very protective of his award. He asks me to shine the glass with glass cleaner almost everyday and this is a pic of him the night he was on TV and he took the award to bed with him. Passed Out, Protective and Proud !!!! Thanks for reading our proud parent story. 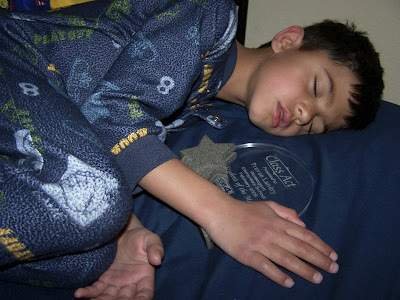 Awwww....look at him sleeping with his award...it means so much to him doesn't it??? I can't wait to see the details regarding Priyasha's party..I love planning them!!!!! How wonderful that his friends surprised him and watched too. Sorry we haven't got together yet. I haven't been very good company since Dad died. Always enjoy your photos.